SpiceJet introduced the Q400s in 2011 as a game changer. The move was not in line with what low cost carriers world over had practiced. After Air Deccan, SpiceJet became the second low cost carrier (which we prefer to call low fare carrier) in India to adopt a dual fleet strategy. The reasoning was simple enough. First, India is a country where certain routes are saturated while many routes with potential are unexplored. This is largely due to the misconception of a ‘one aircraft fits all’ strategy. Having an oversized airplane (in terms of seats) fly on routes that have insufficient demand only leads to poor control on pricing and revenue management. The hope that some routes will eventually grow to cater to the large jet is unwise. The right sized airplane matters. Second, blindly copying and pasting to India a low cost model that worked wonders overseas is again unwise. Every market is unique, and requires its own study. But perhaps, SpiceJet wasn’t ready to handle the Q400. Perhaps, SpiceJet did not pull off a good deal with Bombardier. Perhaps, SpiceJet’s study was half baked. Perhaps, SpiceJet was short sighted and the turboprop may have performed better in the hands of a smarter, shrewder operator. But most importantly, perhaps the Q400 fleet and staff were meted with a step-motherly treatment. Optimisations in the Q400 fleet are only now becoming visible. Ajay Singh is using pressure tactics to squeeze Bombardier to give the airline more. A few Q400s are expected to join the fleet, with the insurance payoff from the Q400 that was written off in a runway excursion at Hubli. The Q400 fleet size reduced to 14 Q400s from 15, and one Q400 that was cannibalised has now been restored and is apparently due for a maintenance test flight. The airline has also started to optimally fly its airplanes, to realise fuel savings and time savings. Time saved can accumulate to fly an additional sector. The airline is also working to better integrate the Q400 network with its Boeing network. After all, the Q400s are intended to primarily serve as feeders. Salaries of the Q400 flight crew have been brought on par with those on the Boeings. The airline, four years late, has realised that the Q400 cannot play the ATR game. The Q400 must play the Q400 game. The turboprop has been designed to cater to routes that are as thin as the ATR’s, but longer than what the ATR s suited to fly. And that the USP of the Q400 is its speed. The difference between the games of the Q400s and ATR72s? The Q400 focuses on maximising revenue potential, while the ATR72 focuses on minimising costs. Those aren’t the same variety of apples to compare. Simply put, the management wasn’t ready for the Q400. As of today, 13 of the 14 Q400s in the airline’s fleet are active, with the 14th expected to join soon. Effective 16th July, these 13 Q400s will operate 116 flights a day, operating for a total of 149:20 hours each day, and deploying a capacity of 9048 seats on the network, daily. Each Q400 flies on average almost 9 flights a day, and is utilised to just a minute short of 11:30 hrs per day, per aircraft. A year ago, the utilisation was at 10:20 hrs. Of the 116 departures, the airline flies 76 routes (where the onward and the return are treated separately) between 38 city pairs. This is on average a frequency of 1.5 on each route. The Q400s serve 28 destinations, resulting in an average of 1.3 city pairs from each destination. Of the 38 city pairs, 10 are monopoly sectors. Of the 38 city pairs, 34 are exclusively operated by the Q400s by SpiceJet. Of the 28 destinations, 15 are exclusively Q400 destinations. Refer the diagram below. The Q400 flies the longest turboprop sector in India, between Jabalpur and Mumbai. Sectors like this are what the Q400 are better suited for: longer than those of an ATR, shorter than those suited for a jet. Monopoly sectors are in yellow. Nearly 90% of the city pairs are exclusively operated by the Q400 at SpiceJet. 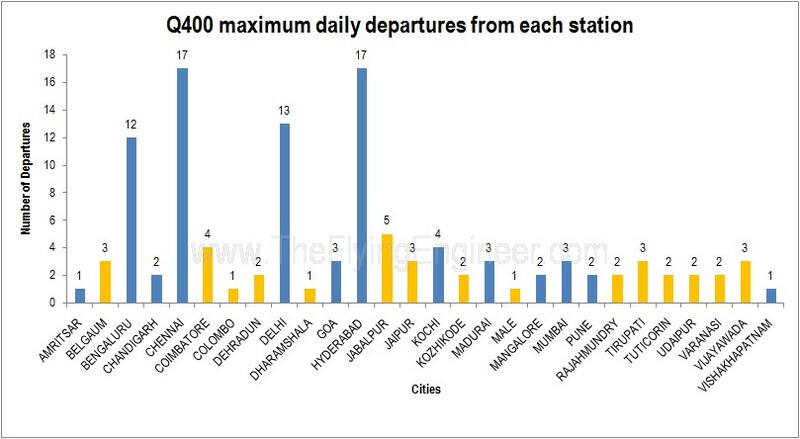 The most important stations for SpiceJet’s Q400s are, in order of departures, Hyderabad, Chennai, Delhi and Bangalore. Bangalore, despite being a hub, is not a base for the Q400s. Jabalpur is important to the airline. Q400s from Delhi are swapped with the Q400s from Hyderabad at Jabalpur, necessary for maintenance which is at Hyderabad. Q400s from Chennai swap with the Q400s at Hyderabad through the Goa flights. 53% of the stations served by the Q400 are exclusive Q400 stations for SpiceJet. Of the above stations, Belgaum and Tuticorin are exclusively served by SpiceJet, and operated to by the Q400s. Belgaum and Tuticorin are examples of airports that are either operationally unfeasible or commercially unviable to operate using a 180 seat jet aircraft. Most of the Q400 sectors listed here are commercially unviable for a 180 seat jet (the market isn’t yet sufficiently big), and atleast 40% of the sectors are not advisable to deploy a jet on, due to short sector lengths. Typically, a regional jet with similar seats offers better operating economics and greater productivity when sector distances exceed 250 – 300NM. Average sector length for SpiceJet’s Q400s is 260NM, which speaks well about the way in which the asset is being used. 53% of the 38 sectors are below the average of 260NM, and 74% of the 38 sectors are below 300NM. Flying the Q400 faster to save fuel? The Q400 can be flown in one of four speed schedules – Long Range Cruise (LRC), High Speed Cruise (HSC), Intermediate Cruise Speed (ISC – between HSC & LRC), and Maximum Cruise rating (MCR). When arranged in order of increasing speeds, this is LRC-ISC-HSC-MCR. Among 16 techniques in which an operator may realise fuel savings, optimisation of cruise speeds realises the largest potential gain. The Specific Air Range (SAR) curve below shows the distance travelled per pound of fuel. Higher the SAR, the longer the distance that the Q400 can cover for the same quantity of fuel. While LRC (red line) would be the choice of speed for any operator who considers only fuel costs, SpiceJet used to operate its aircraft at ISC (purple line). This burnt more fuel, but saved time, which results in reduced time-related costs, and higher productivity. Of late, SpiceJet has been flying its Q400s at HSC, for flights of around 1 hr in flight time (not block time). This translates to flights of sector distances of 300NM and below, which are 74% of all sectors flown by the Q400s at SpiceJet. Flying at HSC should, according to tables, burn more fuel, but pilots do report savings of around 150Kgs of fuel per sector. 150Kgs of fuel saved is around 14% of the trip fuel for a one hour flight time sector, which is a significant amount. Such high fuel saving percentages with an increase in speed is not possible. The only explanation could be a host of other procedures that have been implemented that impact the overall fuel consumption. Better routing to take advantage of winds can have significant impact on fuel burns. Optimisation of weights, climb and descent profiles, improvised taxi procedures and approaches, use of detailed performance tables, and better APU management are some of the ways which fuel burn can be reduced. The Q400 is an aircraft that must be used as a high speed aircraft that serves as a compromise between jet-like speeds and turboprop economy. Pushing the airplane to perform to either extreme is a significant deviation from the intended purpose of the aircraft, which leads to inappropriate and poor asset utilization. Asset utilization seems to be on the increase. The Q400 is deployed on those routes on which a 180 seat jet cannot operate, thereby allowing SpiceJet to grow its roots into untapped markets to feed traffic to the mainline network. It is a gap filler. With more flights a day, the aircraft is being flown to its revenue generating potential. The networks of the two fleets – jet and turboprop are being aligned to cater to a hub and spoke model. However, a good narrow-body jet fleet size is required to allow the airline to make the most of the connectivity offered by its turboprop fleet. AirAsia India announced its plans to operate to the north, connecting Bangalore with Chandigarh and Jaipur effective September 5th, 2014. The new routes, and an additional frequency on the Goa-Bangalore vv sector will be supported with a fleet of two aircraft. The second aircraft for AirAsia India is expected to be delivered in the month of August. The plan to fly to the north with the arrival of the second aircraft is in line with Mittu Chandilya’s-CEO AirAsia India-statements on June 12th when AirAsia India started its commercial operations. Air Costa, the Vijayawada based regional airline poised to ‘soon’ fly pan India, plays the game of Tier I – Tier II / Tier III connectivity. The airline does not yet fly intra Tier II or Tier III city routes, and does not yet serve Tier III cities. AirAsia India plays the Air Costa game: The only Tier I city it flies to, out of Bangalore, is Chennai. The other cities on its schedule effective September 5th – Chandigarh, Jaipur, Kochi, Goa- are all Tier II. With just its second aircraft, AirAsia India will start flying to the north, and tap a fairly neglected route – Bangalore-Jaipur, and open a virgin route- Bangalore-Chandigarh. Bangalore-Chandigarh was on the cards of Air Costa, but the startup regional airline has had to grapple with too many domestic issues to lend it the speed to expand. The only route flown by Air Costa, not served by others, is the Hyderabad-Jaipur non-stop. AirAsia is appearing less of a threat to IndiGo and more to Air Costa, though the two new players have two different aircraft, which makes a direct competition and comparison impossible. If AirAsia India has well researched its potential Bangalore-Chandigarh traffic, then the airline will stand to reap the benefits of route monopoly. If however the airline doesn’t really fetch the traffic it needs, it would have stimulated the market, allowing Air Costa to then jump in and reap the benefits with a smaller airplane that will cater to a lower demand. But if the market proves to be really strong, it will attract IndiGo and Air Costa on this virgin route. On the Jaipur sector, the only other airlines to offer a direct service are Air Costa and Indigo. AirAsia’s departure to Jaipur is timed 35 minutes before Air Costa’s, and leaves Jaipur at 12:45hrs to return to Banaglore. Air Costa however doesn’t fly the return, allowing AirAsia India to tap a noon slot. Air Costa and IndiGo fly Jaipur-Bangalore only in the evening and later evening, respectively. In essence, AirAsia India has placed itself between Indigo and Air Costa, being a true competitor to neither airline, while easily competing in some form and fashion with either airline on a per route basis. SpiceJet doesn’t offer any flights from Bangalore to Jaipur, or the return. The only possible all-SpiceJet route, not offered by the airline, is a two stop hop via Hyderabad and Delhi, which is least attractive. This is the fallout of poor frequency, even on the mainlines, effectively negating the network spread achieved by the airline’s dual fleet of Q400s and 737NGs. On the Chandigarh front, SpiceJet’s least-total duration connection via Delhi makes the journey 5:10hr long, just 15 minutes longer than IndiGo’s connection via Delhi. The direct flight offered by AirAsia is just 2:55hr long. Increased aircraft Utilization over longer sectors. 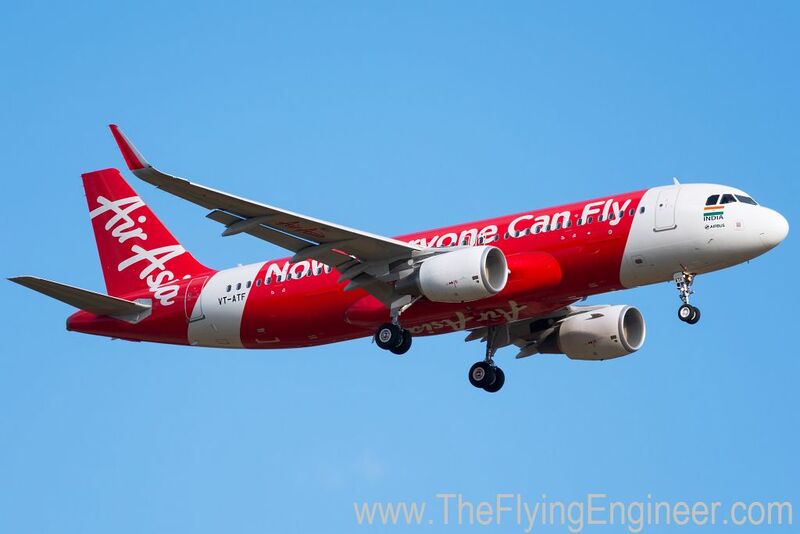 AirAsia India, with its single aircraft, will fly a pattern effective 14th August 2014 that will see 10 flights of an average block time of 1 hour each pick up a total of 10:15hours over 10 flights, with a utilisation efficiency of 69%. The utilisation can touch 12:35 hrs if the airline flies two 1:10hr sectors in the 3:50hr period the aircarft stay’s on ground at Bangalore, as analyzed in this piece. A second pattern effective September 5th 2014, when the second aircraft joins the fleet, will comprise of six flights, each with an average flight time of 2:14hrs, resulting in an aircraft utilization of 13:25hrs, with a utilization efficiency of 85%. 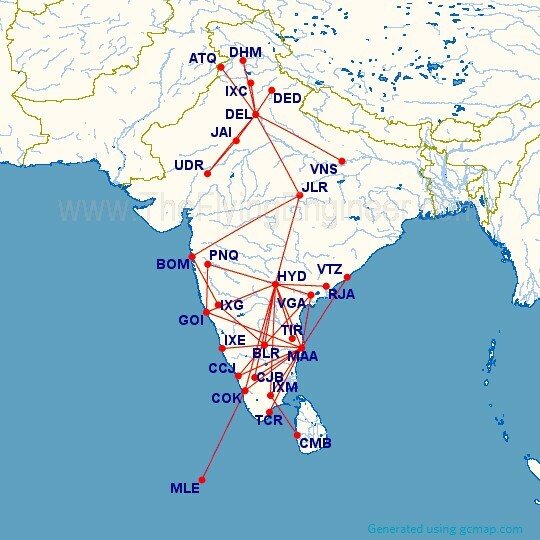 The higher efficiency is due to the longer flights of Bangalore-Jaipur and return, and Bangalore-Chandigarh and return. The airline hopes to, and will be able to, manage a 25 minute turnaround at Jaipur and Chandigarh. However, the 25 minutes planned at Bangalore in the first pattern seems surprising, as analyzed previously. Based on the pattern timings, the second aircraft is likely to arrive towards end August. The airline plans to receive one airplane a month thereafter. Apparently, Mittu said during yesterday’s Chennai press conference that the airline will induct as many airplanes as required to serve as many routes as possible till there are no route combinations left to fly. If anyone should be happy, it must be Subramanian Swamy. AirAsia’s network will open up routes that will benefit the economy, while as of today, not truly stepping on the toes of another airline. Today, there seems to be no efforts taken by AirAsia India to plan its network so as to feed traffic into its sister subsidiaries of AirAisa Malaysia or Thai AirAsia. With routes that fly direct from one region to another, AirAsia India also seems to have a ‘regional’ focus, and by diverting traffic this way, can help de-congest airports like Delhi, which has to handle a significant number of transit passengers today. With the two patterns, AirAsia India will add the capacity to cater to 1 million passengers, annually. As more airplanes come in, and the network and frequency grow, this number will only rise. With an average load factor across all flights today estimated at a realistic 80-85%, the airline will contribute to 800,000-850,000 passenger movements at Bangalore, annually, based on September’s patterns. This may serve to develop Bangalore as a prominent, and possibly a preferred hub and gateway in/to South India. Air Costa yesterday received the approval from the DCGA to fly the Embraer E190s. Air Costa is the first airline in the history of Indian aviation to operate Embraer E190s. The airline started operations in October 2013 with two Embraer E170s. The two Embraer ERJ E190s, with manufacturer serial numbers 593 and 608, registered VT-LBR, VT-LVR respectively, were delivered to Air Costa towards the second half of December 2013, and are leased from GECAS. However, the approval to fly the E190s arrived only 3 months later, due to exhaustive DGCA paperwork, some of which related to getting the aircraft type approved in India. The airplanes have been parked at Hyderabad-Shamshabad’s Rajiv Gandhi International (ICAO: VOHS IATA: HYD). The two Embraer E190s are expected to be deployed into commercial service in the first week of April, and will fly the longer routes in the approved summer schedule. Since the ERJ 190’s license endorsement, as recognized by the DGCA, is “EMB170”, and common with the ERJ 170, pilots in the airline can fly both aircraft variants. The E190s will be based at Chennai, and will be deployed on the following sectors: Chennai-Ahmadabad, Ahmadabad-Bangalore, Bangalore-Jaipur, Jaipur-Hyderabad, Hyderabad-Chennai, Chennai-Bangalore, Bangalore-Vishakhapatnam, Vishakhapatnam – Hyderabad. Each aircraft will start operations at 0600hrs IST, and fly till 2340hrs IST, accumulating a total of 29 block hours per day over 18 flights, representing 56% of the entire fleet’s utilization. The E190s will be utilized approximately 30% more than the E170. The Embraer E190s are an all-economy four abreast-single aisle cabin, with 112 seats laid out over 28 rows, with a 29/30-inch seat pitch (some seats will have a comfortable pitch of 30 inches, while the others will have 29 inches). Each of the seats are as wide as 18.25 inches, armrest-armrest, which is a good 1.25inches wider (and more comfortable) than the seats on SpiceJet’s Boeing 737s, and IndiGo, GoAir and Air Asia India’s Airbus A320s, which are all 17 inches wide. In addition, there are no middle seats: only either window or aisle, making the overall experience very comfortable. This comfort will make the airline’s product a preferred one, among regional airlines, today. The 112 seat E-190 has 62% the capacity of an Airbus A320, which the airline feels is the right capacity for the markets they serve today. Another 4 E190s are expected to join the fleet this year. Air Costa has been flying the E-170s with load factors greater than 70%.